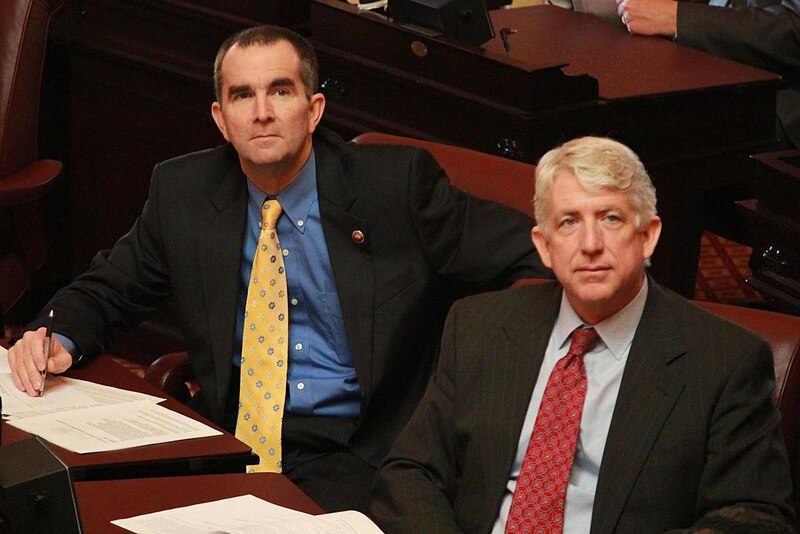 Virginia Attorney General Mark Herring, front, and Virginia Gov. Ralph Northam, back, have both admitted to wearing blackface decades ago. Virginia Attorney General Mark Herring shook his state’s already-reeling Democrat power structure Wednesday by disclosing that he wore blackface to a college party in 1980 when he and friends dressed up as popular rappers. “This conduct is in no way reflective of the man I have become in the nearly 40 years since,” he added. The attorney general’s revelation means that Virginia’s top three elected leaders, all Democrats, are embroiled in controversy. Herring’s statement comes four days after he called on Virginia Gov. Ralph Northam to resign over the revelation Friday that a photo of someone in blackface and someone wearing Ku Klux Klan robes appeared on his page in his 1984 medical school yearbook. And Virginia Lt. Gov. Justin Fairfax, 39, who would become governor if Northam stepped down, has become the subject of a public allegation by a woman, Vanessa Tyson, who says he sexually assaulted her during the Democratic National Convention in Boston in 2004. Fairfax has denied the accusation, saying their encounter was consensual. Fairfax, who is black, criticized Northam for behavior that allegedly occurred 35 years ago while stopping short of demanding the governor resign. At first, Northam, 59, said he made a mistake by posing for the “racist and offensive” yearbook photo, without saying which person pictured was him. But the next day, Saturday, Northam said neither of those in the photo was him. After Fairfax, Herring is next in line to become governor in the event of a vacancy. After Herring, next in line is the speaker of the House of Delegates, Republican Kirk Cox, 61. In the days ahead, honest conversations and discussions will make it clear whether I can or should continue to serve as attorney general, but no matter where we go from here, I will say that from the bottom of my heart, I am deeply, deeply sorry for the pain that I cause with this revelation.